This morning I got up at 6am and left the hotel at 7am. As my GS was parked at another hotel in front, it took time to carry the luggages. It was easy to get to the border. From the town, just got to Pan American Highway and the border was just there. As soon as I came to the border, those guys came to me. They were a money exchange guy and "guides". I asked the money exchange guy how much the rate was and he said COP1,900 = US$1. It was not bad deal. I went to Aduana to cancel Permiso. All I had to do was handing in Permiso and the permission of the extension of Permiso. No check on the motorcycle or nothing. Then I went to Immigration to get stamp out. At the queue, I saw another motorcyclist Steven, who was riding from Buenos Aires down to Ushuaia, then riding up to Colombia. He was doing this trip for a good course - 10,000miles = education for 10,000girls. You can check his website out (geoMeo.org FirstGiving.com/fundraiser/gepmeo/mdg2 - Project 2011). The wait was not long at all. 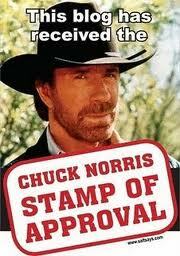 And I got the stamp out of Colombia. Another money exchange guy came to me and offered me COP1,950 = US$1. I asked him if you could do better. And gave me COP1,900 = US$1. If the rate was the same, I would exchange with the first guy. 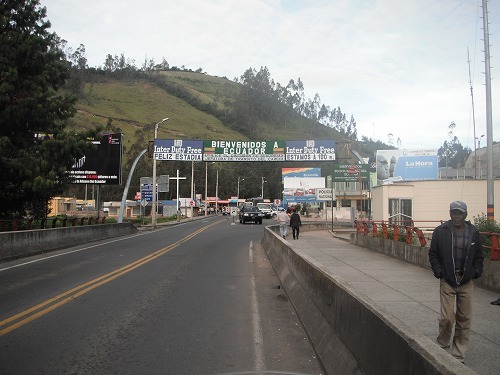 Back to the carpark, I echanged COP to US$ and went to Ecuador side of the border. 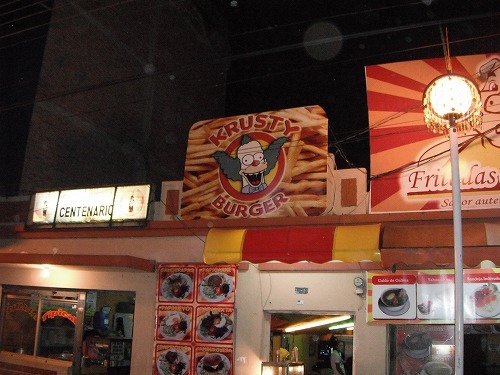 "Bienvenidos a Ecuador", I saw the sign. I asked a policeman where were Migracion and Aduana, and he told me where. Actually it was easy to find out. 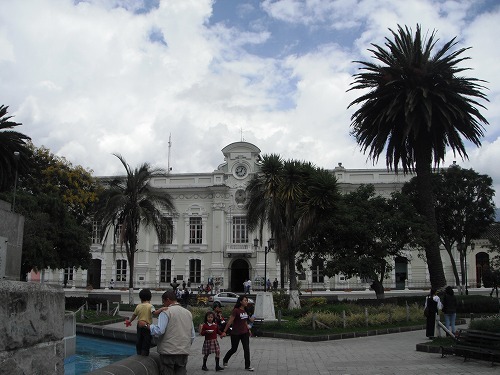 To enter Ecuador, I needed to fill in a tourist card and then get stamp in (free of charge). Then I went to Aduana. At Aduana, I needed to copy of Passport, Driver's License, and the vehcle title. So I went to a copier to make copies. It was 10cent each copy. Getting Permiso was easy. I just needed to hand in copies (the officer did not even ask for the original), and the officer keyed in the detailes to the computer. Then he went to check my GS to see VIN and License Plate were the same as the documents. 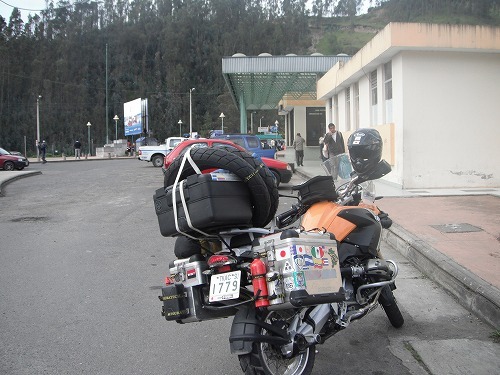 The road condition of Ecuador side of Pan American Highway was good. The country spending in infrustructre and education has lots of prosperity. The petrol price was clazyly cheap. US$1.48/galon for regular (Extra) and US$2.15/galon for premium (Super). Riding through curves and I got to Ibarra, the middle sized city. 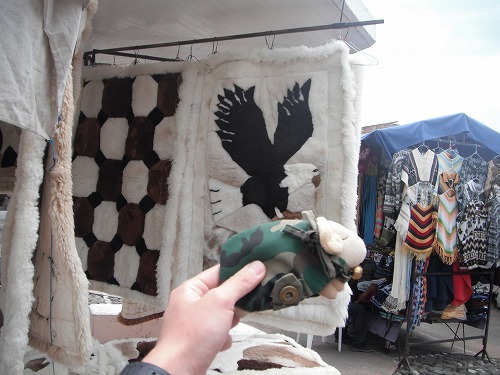 Then another 23km, I got to Otavalo, where is famous for Indigena Market. 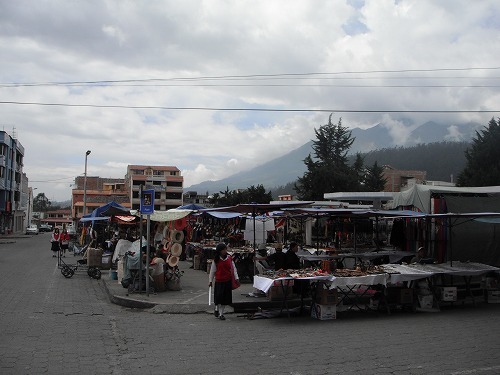 As my GPS did not have the map of Ecuador, once I got to Otavalo, I had no idea where the hostels were. So I made a stop at the road side and checked on Lonely Planet. Hostal Maria was cheapest option and the closest from where I was, so I went there. But the room was US$12 a night. I asked for a dorm but only private rooms were available. It had a car space and got hot shower, so I decided to stay here. My mistake was I did not check if there was WiFI availale before I checked-in!! I went out for a walk in the town. 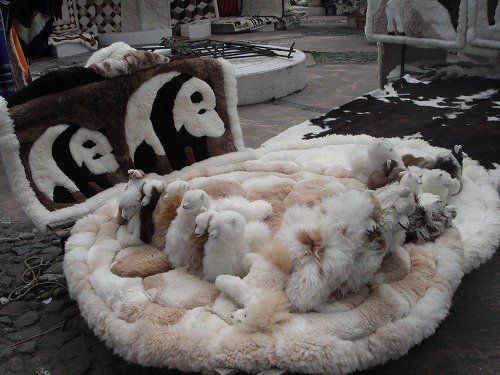 At Plaza de Ponchos, there were stales selling indigenous goods, ponchos, sweaters, bags etc made from Alpaca / Llama wool. I want to buy a poncho. It looks cool and warm. 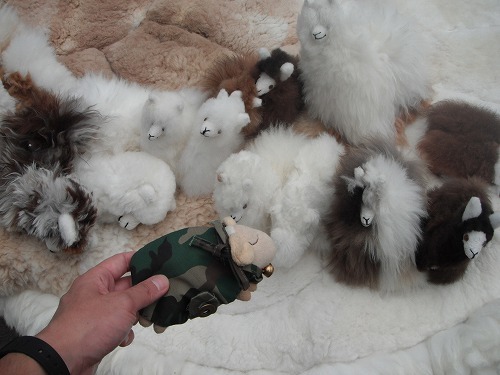 There were Alpaca soft toys on the market and Mr. Sheep was very happy to see his friends from South America. 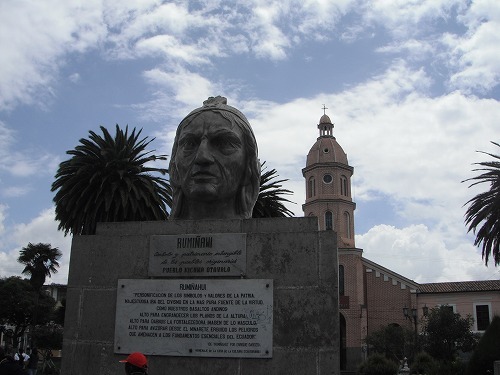 Then I went to Plaza Bolivar, here was a big head statue of Ruminawi. I don't kno who he is but he must be an Inca Hero as here was the part of Inca Empire. I had set lunch for US$1.75! Cheap. 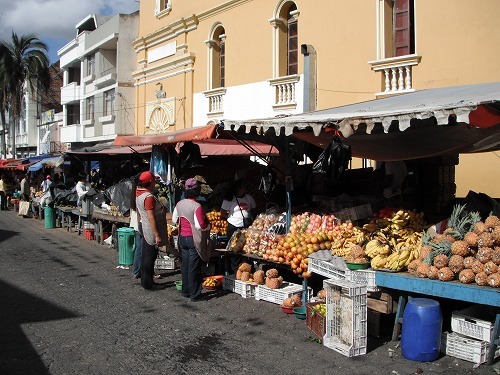 But in Popayan, set lunch was COP3,000, so it was not that cheaper than in Colombia. 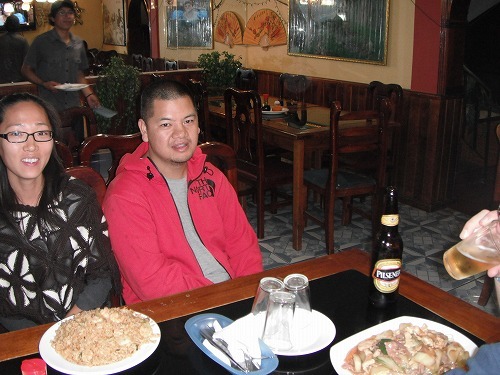 After that, I was checking e-mail at Internet Cafe, and Jimmy and Ji found me there! What a coincident! They said the hostel they were staying cost US$p.p with a car parking space (although it was located at another building). But there was no WiFi. The deal sounded better, so I was onsidering to move to their hostel. Also we went to another hostel "Hostal Ricon Del Viajero". It had a space for motorcyle, coming with WiFI, but no room available. Next door "Hostal Valle del Amancer" had a single private room for US$11 with a parking space nearby, coming with WiFI. Should I move here?? 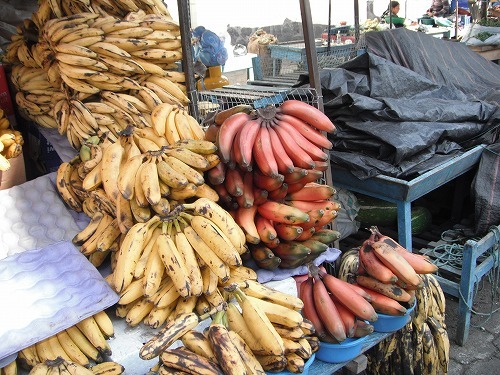 Then we went look around the market and food market. There were full of fruits and veges. Selling very cheaply. 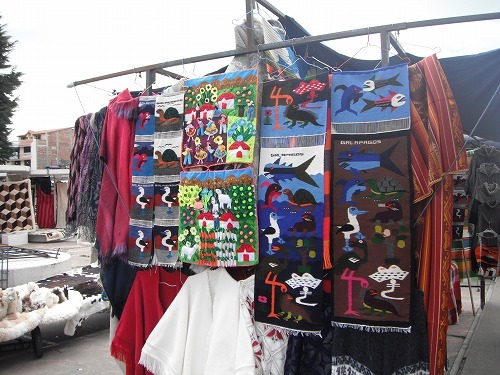 A poncho cost US$15-20. It'S little expensive, but I want to get one. Jimmy and Ji went back to their hostel to take a rest. We made an appointment around 7pm for dinner.